Polish, perfect, and protect all in one step! Don't have the time or energy to perform multiple detailing steps? 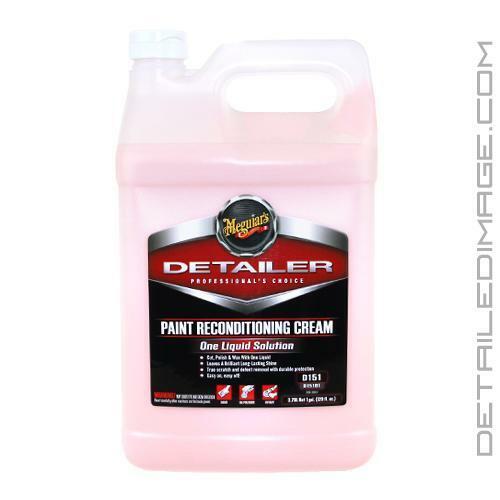 The Meguiar's Paint Reconditioning Cream D151 could be your savior! With this one polishing liquid, you can cut, polish, AND wax. Want to perform a 1 or 2 step process, no problem! D151 is aggressive enough to remove severe defects, yet gentle enough to produce a beautiful swirl free finish. Use a heavy corrective pad (i.e. Lake Country Orange Pad) to remove light to heavy imperfections and follow up with a light corrective pad (i.e. Lake Country White Pad) to finish the paint down, all while using only one polish, the D151! Only have light imperfections? Use the Lake Country White Pad and the D151 for a one step processes. Best of all, it will leave behind a protective layer of wax that not only protects your paint for 3-4 months, but adds a nice layer of gloss as well. D151 was designed to be the ultimate solution for high volume paint reconditioning facilities, like auctions and car dealerships, however it also works great in the hands of professional detailers and weekend warriors alike. So what are you waiting for, remove imperfections, increase shine, and protect your paint all in one easy step! 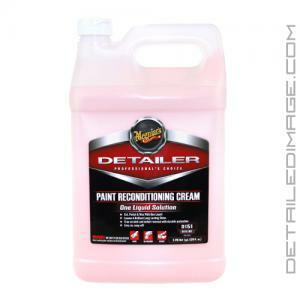 Fast paint defect removal, incredible high shine, AND wax protection...one easy-to-use liquid! DIRECTIONS: SHAKE WELL. Work one section at a time. Always work on cool paint surface. HAND APPLICATION: Apply a thin even coat of product to the surface with a clean applicator pad. Wipe residue with a Meguiar's Ultimate Wipe (M9910). DA POLISHER: Choose appropriate Meguiar's buffing pad. Set machine at medium speed. Apply P.R.C. directly to pad. Begin working P.R.C. in a 2' x 2' area with overlapping passes. Continue working until defects are removed and high gloss is achieved. Wipe residue with a Meguiar's Ultimate Wipe (M9910). ROTARY MACHINE APPLICATION: Choose appropriate Meguiar's buffing pad. Set machine to 1400-2000 RPM's. Apply P.R.C with the appropriate Meguiar's foam finishing pad or applicator pad. STEP2 (OPTIONAL): For additional clarity, gloss, and protection re-apply P.R.C. with the appropriate Meguiar's foam finishing pad or applicator pad. PROFESSIONAL TIP: For added protection, apply your favorite Meguiar's quality wax or sealant.